“Go! Go! Go!” The captain of our fishing boat is yelling. A giant whale shark is calmly gliding alongside our vessel, and it's time to join him. Or her. For the past two hours we have been circling the Mexican waters looking for the largest fish species known to man — a bit of a hit-and-miss exercise these days — and now that we’ve finally located the spotty grey creature, which looks like something out of a prehistoric action flick, there’s a sudden need to snap out of our comfortable lull. It’s the first time in seven days on the still-remote Isla Holbox that anyone has expressed any kind of urgency whatsoever. "Who's first?" he wants to know. My friend’s hand darts up. There's just one problem: we'll be swimming in pairs. So while I'd much prefer to observe for a minute, maybe learn the ropes, I've just been volunteered as well. There's no time to argue. I’m still adjusting my snorkel and mask when we jump overboard, and by the time I’m situated and swimming in the right direction, all I can see is the whale shark’s behind. But what a magnificent behind it is. The trajectory of the 25-foot-long creature’s tail is so huge that my biggest worry is whether or not it’s going to smack me across the ocean like a tennis racket. My concern is short-lived. While we pedal like poodles, the steady strides of the whale shark quickly push it ahead of us, and about a minute later we’re left bobbing on the surface, emitting joyful squeals. Back on board we get to educate the others: Make sure all your equipment is securely on before jumping. Look where the fish is going before you jump in. Don’t think. Just swim. It’ll be over faster than you know and you’ll want to treasure every single second. When I told my parents that whale sharks eat mostly plankton, my father sensibly asked, “How do you know it won’t change its mind?” He’s right. After all, I know plenty of people who call themselves vegetarians ... but occasionally give into the temptation of a burger. But all research (and a cursory look at Wikipedia) confirms that these filter feeders don’t eat people, so we all feel pretty good going in. The second time I drop down into the ocean, however, I come face-to-face with a gaping mouth the size of a designer coffee table. It leads straight into a dark tunnel big enough to swallow me in a single gulp, and I suddenly feel far less confident about the whale shark’s dietary preferences. The next few seconds feel like a slow motion dream as I frantically backpedal, then turn around to swim alongside the creature. It’s over in just a few moments, but I'll never forget it. Hanging with endangered animals in their natural habitat seems like a good idea when you’re in the middle of your mind-blowing excursion. But swimming next to a species that originated 60 million years ago, one can't help feeling, as half a dozen boats circle around, that the experience maybe is not as “chill” for the animal as it is for us. Although their population is unknown, the whale shark is considered a vulnerable species, meaning it is facing a high risk of extinction in the wild according to the WWF and other enviornmental organizations. It's still highly coveted for its meat, fins and oil and is often the the victim of bycatch, getting tangled in fishing gear even when it is not the intended target. When to go: June to September; July to August is peak season. Operators: Each hotel seem partial to its own favorite tour operator, and there are plenty on the island. We stayed at Villas Flamingos who use Holbox Island Tours (you can also email Moguel directly). We were easily able to make reservations the day before, based on both the weather and how successful recent excursions had been. Tours also leave from nearby Isla Mujeres and Cancun. When to go: Whale sharks have been spotted year round, but peak season is between March and April. 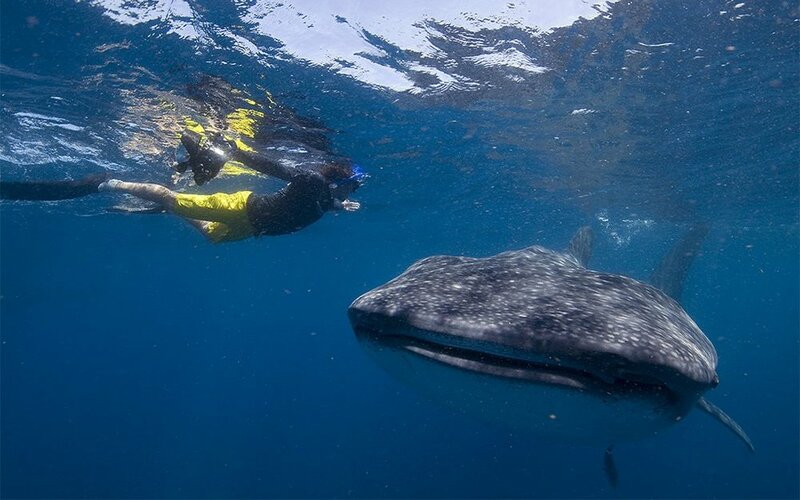 Operators: Several tour companies offer daily excursions, with spotter planes that help find the whale sharks before you leave the shore. When to go: April and May are most consistent for whale shark spotting, but tours are offered until end of June. Operators: Multiple tour companies offer excursion to the Gladden Spit area. When to go: Whale sharks generally arrive between November and June. Peak season is February to April. Operators: Local dive centers organize trips. For Donsol Bay, try Donsol EcoTour or Whale Shark Adventure and Tours for single-day tours or excursions from Manila. Operators: Local dive centers organize daily snorkeling trips in season.